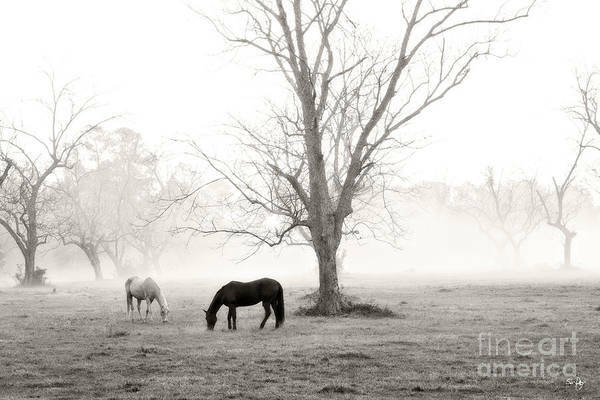 Magical Morning by Scott Pellegrin - 8.000" x 5.375"
Magical Morning art print by Scott Pellegrin. Our prints are produced on acid-free papers using archival inks to guarantee that they last a lifetime without fading or loss of color. All art prints include a 1" white border around the image to allow for future framing and matting, if desired. So peaceful and lovely. Congratulations on your sale. Thank you for the comment Jane. Thank you Kate for the comment and vote. Scott, Beautiful shot! Congratulations on the sale! Scott, Beautiful! Congrats on your Sale! Thank you for the comments, vote and fav. Yes John it was "Magical" and I was very thankful that I had the time to be there at that moment. Thank you for the comment, vote and Fav Cheryl. Thank you for the comment, vote and fav Lianne. 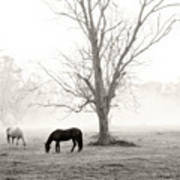 This is a sepia toned image of two horses grazing during an early morning fog. 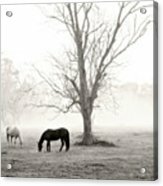 This is also available in black & white and color. Feel free to email with questions/comments. Thank you for looking.